You can just about smell it – Sunday 12th March. The guys I have been riding and training with over the last 4 months are pretty well set and have positioned themselves well to complete the course in a quicker time than previous years, although poor old JK, who broke his leg a few minutes before last years Peaks Falls Creek ride, ripped his hammy a few weeks back which has severely hampered his preparation. Good luck to all who are heading over and doing the loop. Me, I’ll just do some riding at my leisure on the Saturday and Sunday and support the lads with their preparation and drinking. 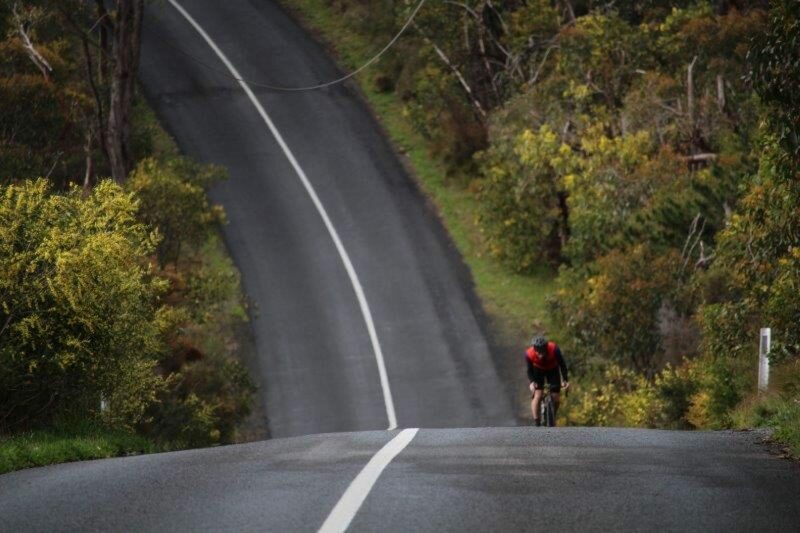 Oh, that little hill at the 170km mark is the 4km 5% grind out of Omeo. Don’t be afraid of it, just be aware it’s there – the first time i did this ride i had forgotten about this and was expecting a nice coast before wtf – no siree. Ah, and the road to Omeo gets a little knarly toward sthe end, no dramas, just be prepared. I’ve been riding for over 10 years now, have had two alloy and 3 carbon bikes in my time, but I’ve been hankering for a titanium bike for quite some time. We’ve all seen them, the raw Ti bike finish just looks great, seeing the welds, the deep lustre of the metal finish, the clean lines, sweet. So, given the chance to try out a locally made Titanium bike that I first saw at the Tour Village back in 2016 was a no brainer. James, the brain behind the Astir brand, is a mechanical engineer with a previous life working with Titanium, decided some time back to branch out into mixing his expertise working with Titanium and his engineering skills with his cycling passion to make titanium frames and build bikes. He’s been plugging away for a while and slowly but surely building up the brand and expanding his range. After first meeting James at the Village, I’ve been sporadically nagging away at him to let me give a Ti bike a try, and just after Christmas he relented, and lent me the try GT bike, a gravel tourer. There appears to be a leaning back toward metal bikes, with newer Aluminium and Steel technologies combined with improved design and geometries matched with decent wheels, seat posts and forks improving the comfort over the older metal framed bikes. However there are still few Titanium bikes on the market, and those that you do are priced quite high, and for good reason, so it is a delight to see James persevere with his passion. James kindly brought the bike up to Norton Summit and gave me a few hours to give it a go over some of the delightful gravel roads around Norton and Marble Hill. The GT, with some good 40mm rubber on the front is designed to eat up bumps on the road, making for a relatively smooth ride and robust handling. Weighing a bit less than 8kgs, its definitely no carbon bike, but the weight didn’t matter when riding up the loose gravel roads. Heck, when the rider I just a tad over 80kg, an extra ½ kilo or so on the frame is really going to matter much. The stiff frame allowed efficient transfer of what power my chicken legs through to the rubber, and with the decent rubber, it was mostly transferred to the gravel base. Without much effort, I put the bike through its paces on a wide variety of road, gravel, bitumen, Roubaix style pavers (yes, the exist, although not as bone shaking as the real thing, Old Cherryville Road, keep an eye out for it next time your riding around Marble Hill) and even a fire trails which disappeared over the edge of a ridge somewhere just east of Corkscrew. This titanium bike shined through on all road surfaces. I didn’t tell James this, but heading down Narrow Ridge Road I was almost cleaned up by a commodore coming out of a driveway. That section of road was a short steep and descent with very loose gravel, which wasn’t too bad until this commodore came flying out of a driveway and came flying up the road. With the loose gravel on the crown of the road and deep gashes on thesides, I was unable to turn as such without the front wheel digging in, so it got a little scary, but the bike held it’s line and we both came out unscathed. The bike felt significantly more rigid than my carbon bike, but it had that good solid feel without losing that feeling of responsiveness and comfort. The GT soaked up the holes and gravel just nicely thank you. It was a fun bike to ride. With some good road tyres thrown on I can see it being a good multi-purpose bike, taking me around whatever gravel I could throw at it as well being the touring bike for the longer sportive rides. If you’re thinking about looking at a Ti bike, give James a call and give Astir a try. The following taken from their website homepage gives you a bit more of feel for what Astir is about. Our primary material is Titanium. We use Titanium 3AL/2.5V (known as Grade 9) straight gauge tubing and double butted to build our frames. This material has been used over the years with great success in the cycling industry. It is lightweight, strong, durable and gives a very good surface finish. Tubes are selected with an emphasis on giving a comfortable yet confident sporty ride. Model variations are the (Road) Classic, Sportive, Brevet, Titan, (touring and commuting) Touring and our eBikes. (designed and engineered in Adelaide South Australia). The models are a guide and can be changed to suite your requirements and riding style. This weeks Rider of the Week is James Raison. If you haven’t seen James out and about around Adelaide, then you’ve been riding with your eyes close. You’ll soon understand what I mean. This is James cycling story. I’m James: rider of bikes, editor at La Velocita, eater of the burgers, ice cream destroyer, tyre pressure zealot, charismatic stallion, all-round legend, 30 years awesome, and exceptionally humble to-boot. You have registered for the Indian Pacific, a ride starting in Fremantle and finishing at Bondi Beach. I’ve got to ask it – why? There’s a few answers to that: challenge, adventure, fun, and growth through adversity. Plus, I’ll be dead one day and nobody gets a second shot at life. I understand yo have a pact with a fellow competitor, something about crossing the line hand in hand at the end – is this true, and how deep is the man love running between the 2 of you? Nah, no pact. We’ve agreed that we’re happy to ride together while we’re on compatible pace so nothing pact-like. This is a solo challenge and you have to be prepared to do whatever it takes to get yourself to the finish line. Maybe we finish together, maybe we finish a week apart. Who knows? It’s a long race. How are you feeling with the race just just around the corner? Pretty relaxed considering what I’m staring down. Mostly I’m looking forward to starting. Once it’s over then I can move on. This race has dominated my thoughts, emptied my bank account, and cost me a lot of sleep over the last few months. I’m just looking forward to getting back to normal life afterwards. Can you give an overview of the training you been doing of late? I did a training shakedown over the Australia Day long weekend that was 930 km in 3 days. Since then I’ve been keeping up the riding but am focusing more on getting my body in good shape with stretching and basic strength training. I’ve also been eating my own weight in ice cream. I need some body fat to get me across the country. It sure isn’t what a lot of people expect when they ask about my training. Physical ability only lasts a couple of days. After that it becomes about managing your body and having the mental strength to keep going. OK, enough abut the Indy Pac, lets learn a little about who James is. How long have you been cycling? About 13 years just after I finished high school. A horrific hangover. I got totally wasted on cheap vodka and woke up with only about 20 minutes before I was due to work at my glamorous checkout job. So I grabbed my barely functional mountain bike I got when I was 12 and sweated my way to work. That was literally how it started. I rode to work every day from then on. Then I rode everywhere.It just grew from there. I have never had a driver’s licence, I just ride bikes. Currently I have four. A Giant TCX for gravel grinding and commuting, a Daccordi Furioso when I feel like being a vintage steel hipster, a Bottecchia Emme 2 which is my fast-light-carbon bike, and the Curve Belgie Spirit that can do almost anything. I just grab whatever best suits what I’m doing, or whatever feels like it’ll be fun. I’d say my Curve with a few mods to weenie it up. It’s currently in endurance spec and I can’t wait to shed some weight off it when I get back from Indy Pac. If money were no object I’d throw Dura Ace 9170 on, a Tune Schwarzes Stuck seatpost, and some Tune Airways wheels. Maybe get some ultralight tyres as well. Get that sucker as light as possible. That’s all the bike I’ll ever need. How do you store your bikes? Steadyracks. Annoying to install but they’re brilliant. Do you do all your own maintenance or do you use a LBS? If so, which one? I do basic maintenance myself but I get regular servicing at Bio-Mechanic Cycles and Repairs (BMCR). Pete and Andrew are phenomenal mechanics who work wonders on my bikes. They’ve also found some damaged components that could have ended in serious injury to me. So I trust them. Lia’s customer service is second-to-none as well. She’s very patient with my frequent emailing! They’re the best. I went and spoke to them as soon as the Indian Pacific Wheel Race was announced. I wanted them to build my rig and Pete has been tweaking it for the last couple of months. It’s one hell of a bike thanks to his expertise. What cycling specific tools do you have in your “bike shed”? Nothing too special. Some nice allen keys, various tightening/loosening tools, a servicing stand, and a crapload of baby wipes. Those baby wipes are magic for bike cleaning. What is your favourite piece of cycling kit or accessory? Garmin. I love numbers and have a terrible sense of direction. Almost everything. The fun, the freedom, the physical and mental health benefits, the challenge, the shiny things, and the social side. I was quite overweight as a teenager so cycling has become the ultimate expression of transformation and change from what I was. That’s why I love climbing steep hills so much. Riding a bike changed the course of my life and is the single most important influence on who I am today. Just to be cliched: Peter Sagan. His abilities are staggering but the way he conducts himself on and off the bike sets him apart. From what I hear, he’s just a really nice guy and everyone likes him. Well, one has to be Peter Sagan for obvious reasons. Brad Wiggins because he’s a phenomenal athlete who has reinvented himself many times in his career. I think he’d be fascinating to talk to. Alex Howes would be the last. He is just a straight-up cool guy. I chatted to him a bit at the TDU this year and he’s very friendly. I’d love to go for a ride with him. Wherever makes good burgers. I don’t have much time for really fancy food. I’m a simple fella. What are your craziest/fondest cycling memories? Riding 1,080 km from Melbourne to Adelaide with 3 mates was my craziest challenge to date. We smashed ourselves riding with about 2 total hours sleep in parks and ditches for the whole ride. We pushed it to the limits. Exhaustion, sleep deprivation, hallucination, we went through it all. We had fun the whole time though. The banter went for 60 straight hours. The worst was probably when a kangaroo wiped me out last year while I was trying to do all 4 Dirty Dozen courses in 2 days. I was abut to finish the second course when a kangaroo smashed into the side of me. I was lucky not to break anything but my bike was cracked, several components broken, and my helmet was ruined. What is your favourite post ride coffee/tea spot, and what would you normally buy as a treat? Favourite post-ride treat is a Cibo iced coffee. I don’t really like Cibo but they make the best iced coffees. Other than that, I have a few good coffee spots: Red Berry Espresso, Brick and Mortar, Pave, Coffeelosophy, and more. Depends where I end up. Do you have a favourite overseas country in mind you’d love to take your bike to? Japan. There’s vending machines everywhere and the Japanese people are absolutely fantastic. I’d love to go back with a bike and do some exploring. Mt Osmond is my favourite area. I love the steep climbs and the beautiful views. I haven’t had to resort to that thankfully. She hasn’t asked what the total spend was on my Indy Pac setup. Hopefully she doesn’t! A power meter for my Bottecchia. It runs Campy so options are really expensive. Is there a cycling outfit/company/cycling club/cycling group/person that you would like to plug? So many! I’m very proud of what we’re doing at La Velocita. We’ve had massive growth running on the smell of an oily rag. We’re growing because passionate and talented people contribute. It’s pretty fantastic. Massive thanks to Cycle Closet as well for supporting me for Indy Pac. They’ve sourced a lot of really high quality gear for me to use. Finally, my pokey YouTube channel: RideAdelaide. It’s a silly little project I’ve started but I get a lot of pleasure out of it. The chill. It’s an easy going town and it’s just a nice place to be. Pretty much all the interstaters who come to visit are cyclists so I take them out and blow their minds on our awesome roads. Is there anything else you feel like talking about? Not really, just ride bikes. Arguably the best race of the year. Olympic Champion and new 2017 Strade Bianchi champion, Greg Van Avermaet gets his first Monument. Oh, and if your i any doubt about the Strade Biancha being one of the best spring classic rides on the calendar, have a look here. Some stunning photos from Gruber Images, partciularly with the behind the scenes access the photographer is goven. A few of the photos from this site to whet your appetite. And the Paris Nice – still a few more days to go, but a few snaps so far. Its looking bloody cold over there. Located only minutes east of Adelaide’s CBD, in the heart of the City of Norwood Payneham & St Peters are three boutique cellar doors and a micro-brewery. Four relaxed environments so close to home, the Eastside Wine & Ale Trail is designed to let you hear the history and stories behind the operators as you sip and sample your way along the Trail.